Free mini manicure set at TEMT BUGIS plus when you spend over $50. Happy Shopping! Terms and conditions apply. One per customer, one per transaction, while stocks last. 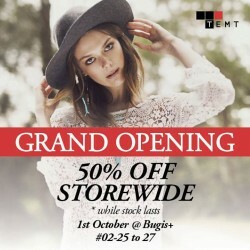 Join there Grand Opening at Bugis Shopping Mall Get 50% OFF storewide. 4 DAYS only. While stocks last. Term and Conditions Apply. TEMT | 50% off storewide sale at [email protected] store 22 - 28 Dec 14. TEMT SG is celebrating their 1st Anniversary with you! Enjoy 50% off storewide sale ONLY at [email protected] store, from 22 - 28 Dec 14. Hurry and join now for this amazing event! It is perfect time for this biggest season of the year! TEMT is located at 313 B1. Make sure to visit the new VivoCity store to get your 50% off discount! 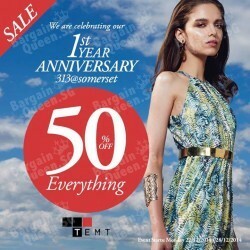 Enjoy 50% off Everything to celebrate the new store opening. Key trend for this season is wearable art in all types of prints! 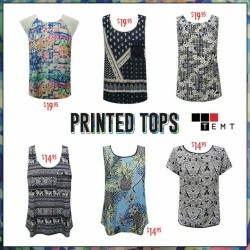 Enjoy printed tops from $14.95 at TEMT SG.